Daniel F. Florio Jr., Esq. 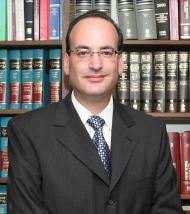 Mr. Florio is a Partner in the firm, and a graduate of Brooklyn Law School. He is admitted to practice in New York and Connecticut. Mr. Florio is primarily responsible for the firm's consumer and commercial debt litigation practice on behalf of creditors, including large and small businesses and commercial lenders. He has extensive experience in the field of judgment enforcement, and vast knowledge of the fuel oil business. Under Mr. Florio's direction, the firm has dramatically increased its ability to track debtors and assets, and is frequently consulted by other attorneys for guidance in such matters. Mr. Florio is a member of the National Association of Retail Collection Attorneys (NARCA), the New York State Bar Association and the Colombian Lawyers of Westchester County.